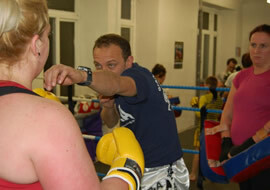 Personal training is ideal for a variety of people and a variety of reasons. Some students take personal coaching sessions because they want to develop their skills faster, others because they prefer the intimacy of 1 to 1 coaching. Some students book personal coaching sessions so they can work on specific skills or areas, others because they struggle to make the times when classes are on. We have a great selection of personal trainers who can tailor each session to your own specific needs and requirements. All of our personal trainers are either active or retired fighters and are very experienced in what it takes to deliver positive results. As well as the usual variety of male and female personal instructors in Thai Boxing we also have specialist trainers who are fully qualified in kettlebells, fitness, strength training, Metafit, exercise to music, group fitness and weight loss. Whatever your goal/motivation and or dream we have coaches to help you achieve and beyond.